Provide comfort for the family of Wanda Damron with a meaningful gesture of sympathy. Wanda Sue Damron, 69 of Pikeville, Ky passed away Sunday, December 2, 2018 at the Pikeville Medical Center. Sue was born April 20, 1949 at Pikeville, KY to the late Virgil & Thelma Coleman Huffman. Besides her parents she was preceded in death by two great grandchildren, Madison Perkins, Trey Looney & a sister, Brenda Kay Adkins. 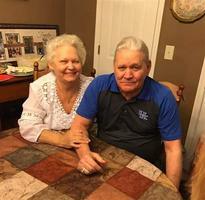 She is survived by her loving husband of fifty one years, Lloyd “Sam” Damron of Pikevile, one son, Lloyd “Kevin”Damron & his wife Michelle, of Pikeville, two daughters, Melissa Perkins, her husband, James of Shelbiana, KY, Angela Perkins, her husband Greg of Virgie, KY; six adoring grandchildren, J.J. Perkins, Nathan Perkins, Justin Damron, Kaitlyn Damron, Talisa Case & Erika Perkins, seven grandchildren, Aubrey, Bryson, Hannah, Rhylin Perkins, Carter Case, Lillian Phillips & Haisley Collins, three sisters, Donna (Darrell) Keene of Shelbiana, Teresa Huffman of Shelbiana, Leshia Keene of Pikeville, one brother, Paul (Rose) Huffman of Shelbiana, KY.
Sue was a loving wife, mother, grandmother & great-grandmother & a member of the Poorbottom Freewill Baptist Church. She will be sadly missed by all who knew and treasured her. The family will accept friends at the Thacker Memorial Chapel, Tuesday, December 4, 2018 at 6PM and Wednesday, December 5, 2018 with services each night at 7:00 P.M. Funeral services will be Thursday, December 6, 2018 at 1:00 P.M. with Richard Gibson, Chris Bartley, Adam Akers & Oscar Damron officiating all the services. Burial will follow at the Coleman Cemetery at Shelbiana, KY.
To send flowers in memory of Wanda Sue Damron (Huffman), please visit our Heartfelt Sympathies Store. Provide comfort for the family of Wanda Sue Damron (Huffman) by sending flowers. Our Sweet Wanda Sue...today we laid you to rest :( and it seems so unreal that we have lost you so soon!! You are so loved & out hearts are broken 💔 you will be missed and always in hearts**Heaven has gain a Beautiful Angel! !